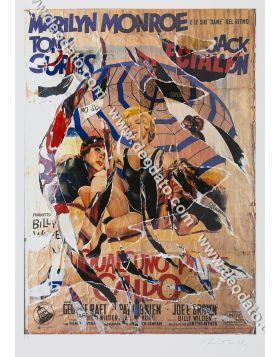 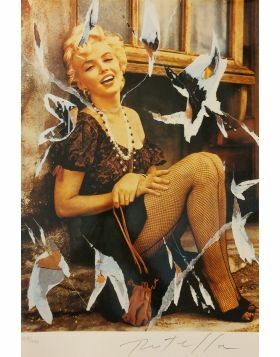 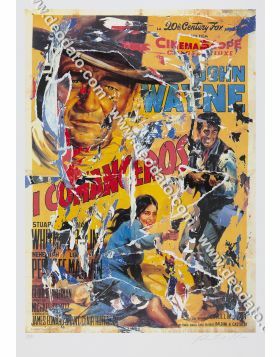 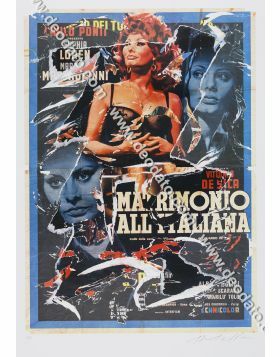 Mimmo Rotella's seridecollage ripped by hand with the '60s Batman poster film. 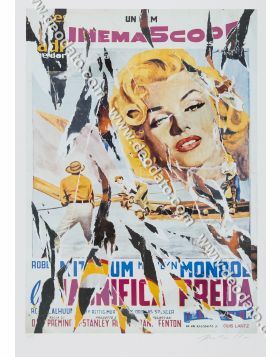 Rare SeriDécollage with tears handmade by Mimmo Rotella depicting Batman, in the poster of the 1966 film based on the homonymous TV series. 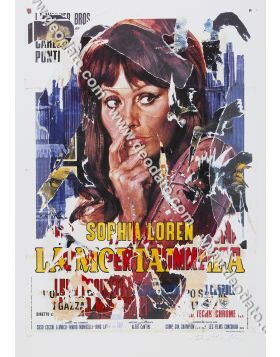 It is a spin-off of the television series Batman, and is the first film about Batman and the first dedicated to a superhero. 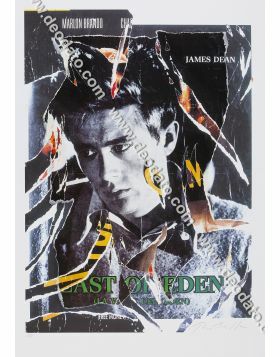 Very few fans remember him, because he had little success. 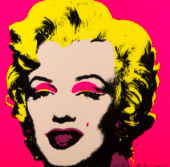 Nota Firmata in basso a dx. 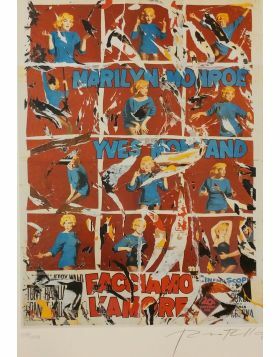 Timbrata a secco dalla Fondazione Mimmo Rotella in basso a sx. 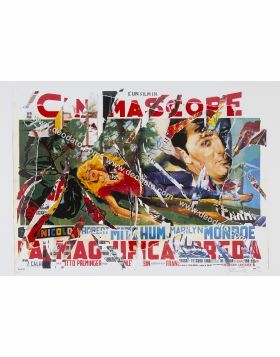 Mimmo Rotella (Catanzaro 1918 - Milan 2006) is a famous italian artist of the IXX century. 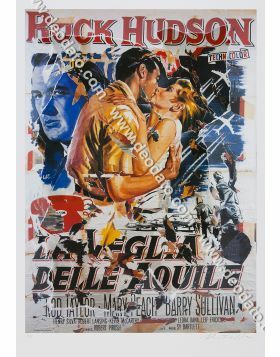 In 1941 he had to take part in the War and when he returned home he graduated in 1944 at the artistic high school of Naples and then started to teach art in Catanzaro. 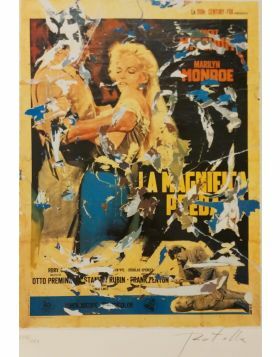 In 1945 he was in Rome where he came into contact with the Avan-garde movement and the artists Carla Accardi, Ugo Attardi, Pietro Consagra, Piero Dorazio, Mino Guerrini, Achille Perilli, Antonio Sanfilippo and Giulio Turcato. 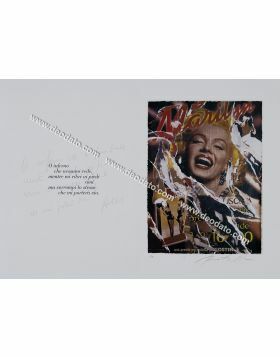 From 1947 he has the first contacts with foreign art, expecially the french and the north american arts. 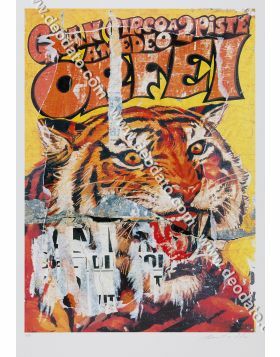 Thanks to a Fullbright Fondation grant he went in the USA as an Artist in Residence, in the Kansas University. 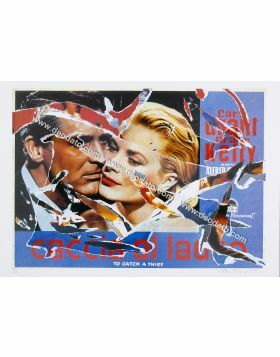 This american experience allowed Rotella to discover e know all the most important artists of the artistic trends of those years. 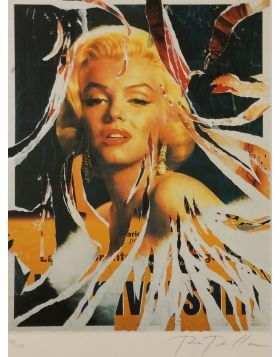 After a short stop in his artistic production, he started with the Decollages. 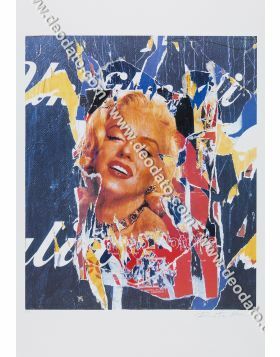 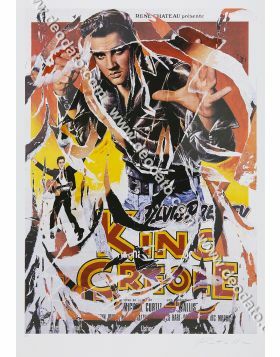 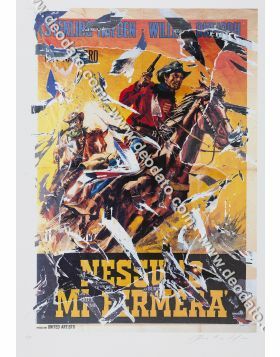 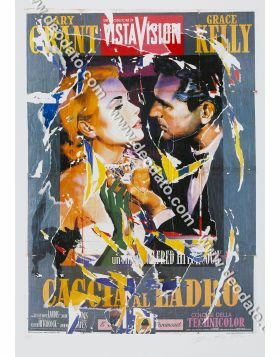 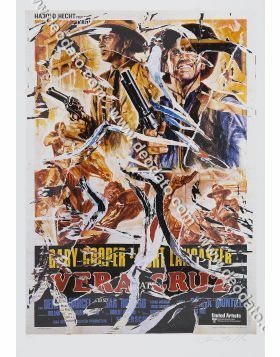 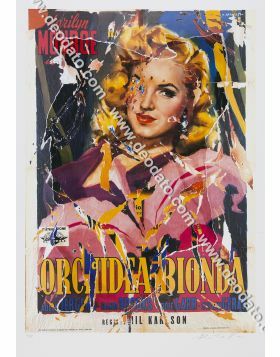 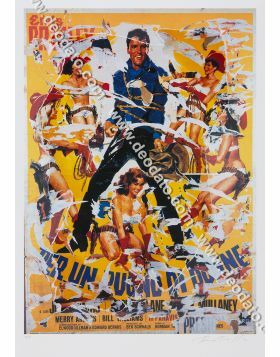 Mimmo Rotella took all the comunicative strenght of the commercial and added on posters, and then he put them together on the canvas. 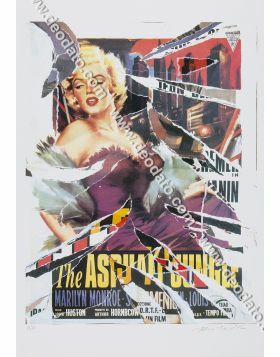 His first exposition of this kind of artworks was in Rome, at the exhibition “Esposizione dell’arte attuale”. 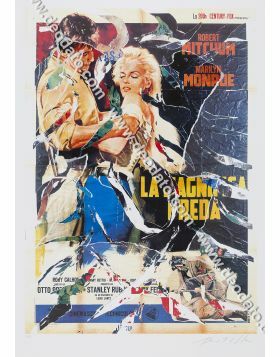 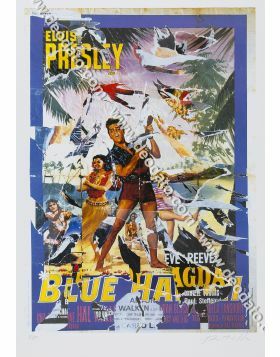 This new style culminates in the Cinecittà series, made in 1962, and inspired by the celebrities and myths of the italian and Hollywood movies. 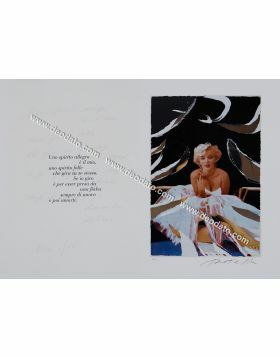 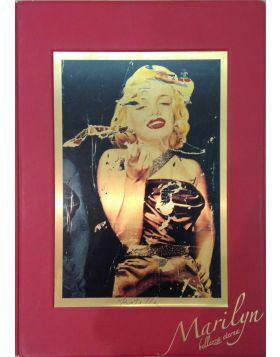 Marilyn Monroe was one of his most important subject. 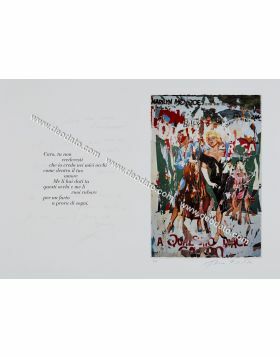 In 1964 he exposed in the Biennale of Venice and in 1965 in the Quadriennale of Rome. 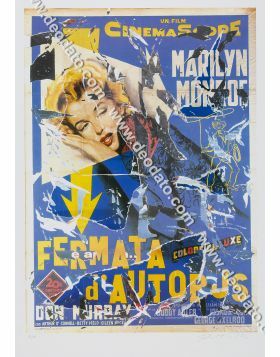 With the aim to collect the works and documents relating to his artistic life, in 2000, by his will, was formed Mimmo Rotella Foundation. 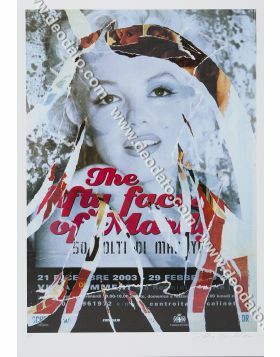 In 2004 he received an honoris causa degree in Architecture at the University Mediterranea of Reggio Calabria. 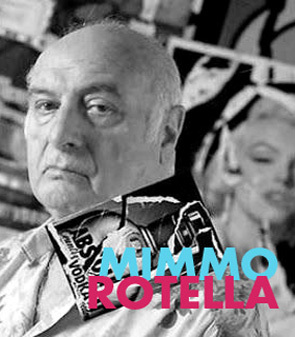 Mimmo Rotella died in 2006. 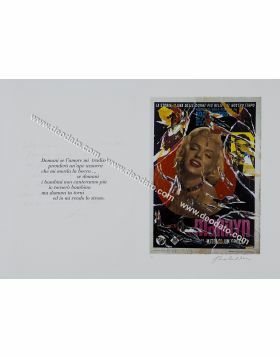 His works are in many museums and in the major Italian and foreign collections. 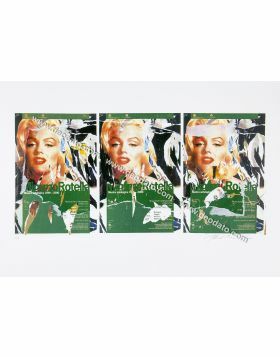 This work has no frame so it will be protected with a rigid supports and shipped very quickly in one day from payment. 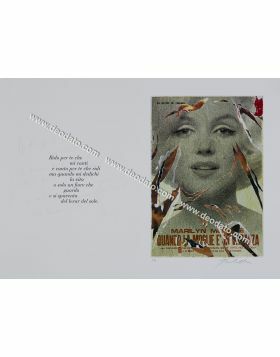 If the shipment is outside EU it is necessary to prepare an export documentation: that can take up to a week of time. 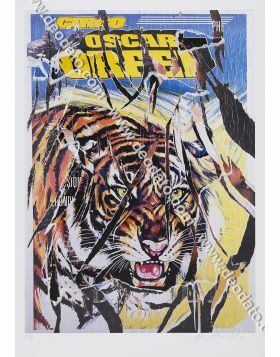 We will pay for the shipment if we lose or damage it!